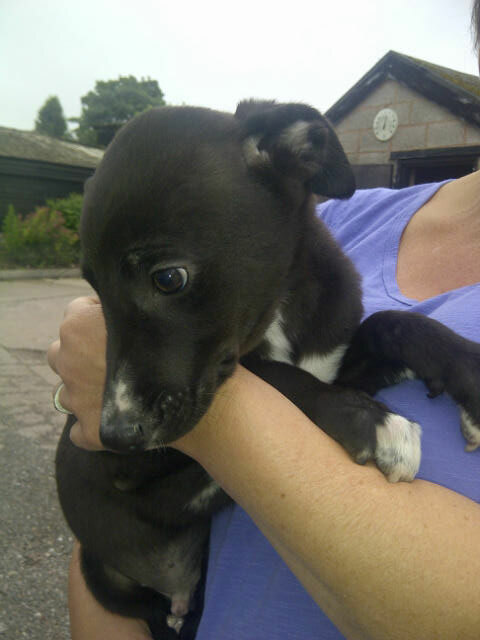 Courier M collected two Lurcher Collie cross puppies from breeder Sally Handcock in Sutton Coldfield. These two youngsters, who don’t yet have names, are travelling with us to their new owners in Fife in Scotland. 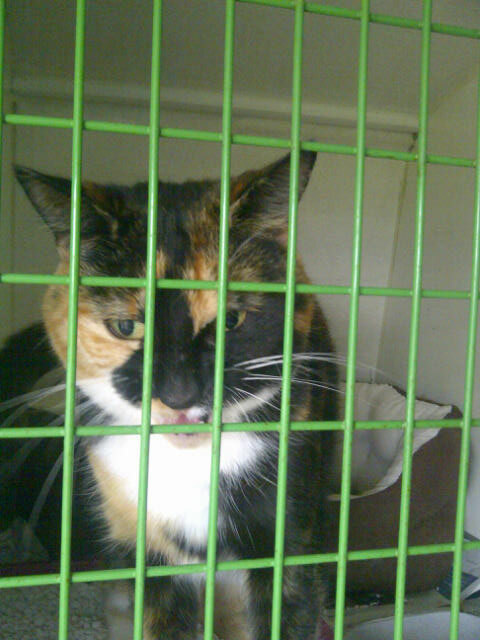 Also on board was lovely tortoiseshell cat Chunky. This chatty, friendly puss is on her way from Sussex to Cumbria. 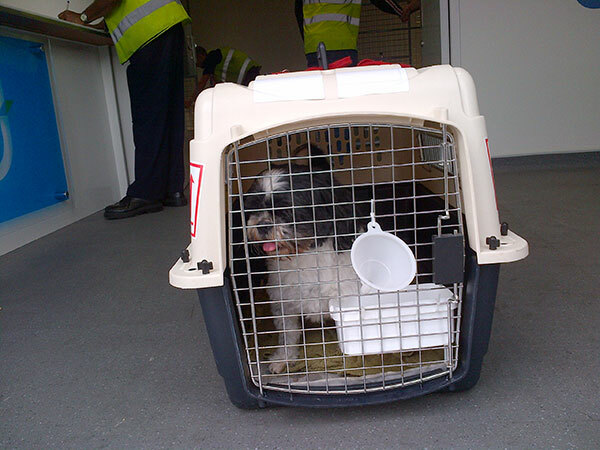 Meanwhile courier S made sure stunning Siberian Husky Anakin and incredibly cute Shih Tzu Bob got to Heathrow airport in plenty of time for their flights. 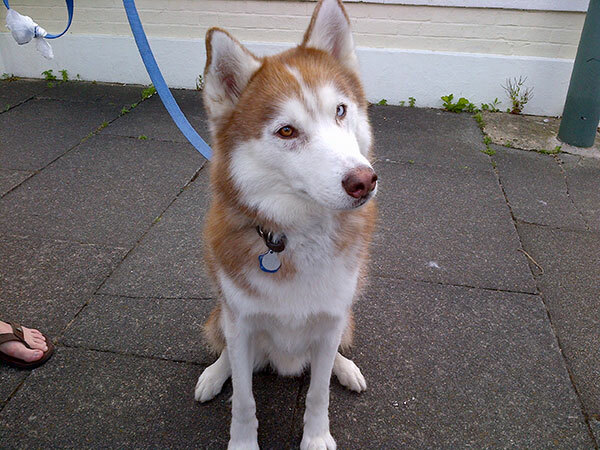 Anakin from Hove in West Sussex is flying to New Zealand where his owners are relocating. Anakin was originally born and raised in the US, and accompanied his family when work brought them to the UK, so he’s a seasoned traveller who takes flying in his stride. 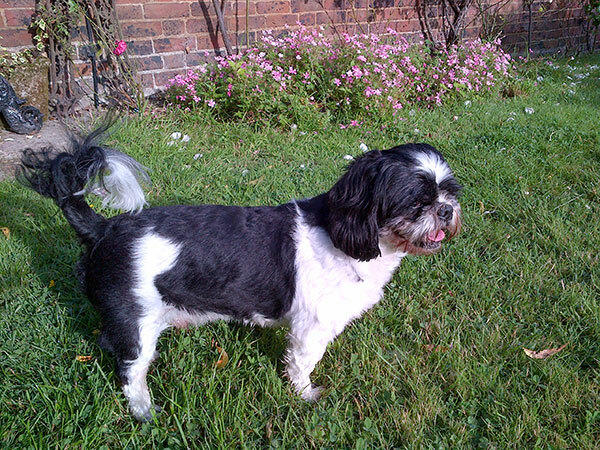 Bob travelled with us from Lancashire, where his owner shed a few tears at the prospect of even a short time apart. 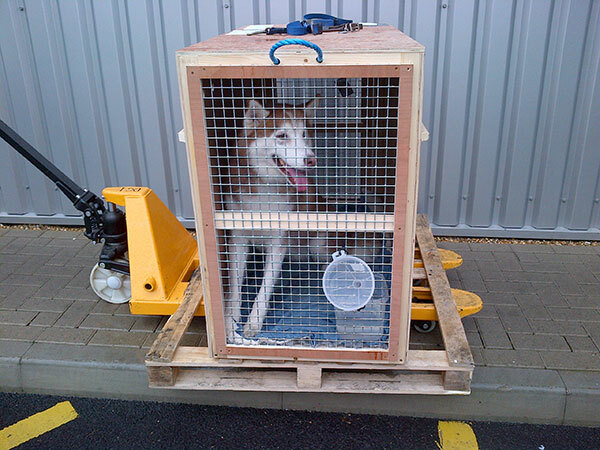 He spent the night before his flight home boarding with Animalcouriers, then it was off Heathrow for his flight to Australia, where he’ll be reuinited with his family. “Flup and Sailor arrived this evening! And oh my god are they cute! Flup is best friends with everything and everyone straight away! He’s just a little bundle of love! Sailor is a little unsure but has already settled down some since coming home so I think she will be absolutely fine in no time! Good thing she has her buddy Flup with her! A last goodbye to a very relaxed Anakin as he head off to board his flight. The airport vet commented on what a beautiful and gentle dog he is. Is Zeus the one who was left behind in Greece? 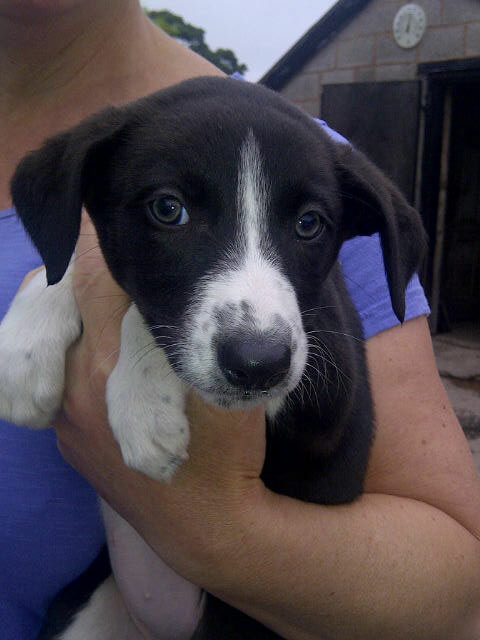 Those Lurcher Collier pups are so darn cute!!! Thrilled the kittens are settling in. Anakin is a beauty and Bob looks so sweet. Anakin is very striking – the vet was very taken with him. Believe it or not, Hugo is a Portuguese Podenco – his wiry hair makes it hard to tell but his ears give him away 😉 We’d have to agree about Shih Tzu’s and terriers. Little Flup and Sailor have that wide-eyed innocence. Best wishes to them in their new home! Beautiful animals in all the photos! 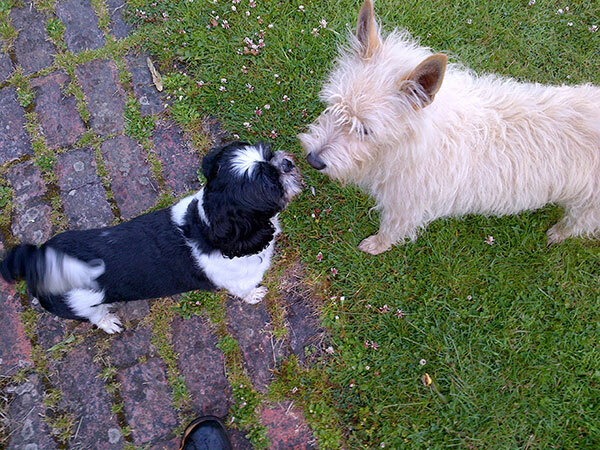 Flup and Sailor have landed on their feet – they’ve gone to the most wonderful home. Sweet little girl puppy is adorable, and so is little boy puppy. Think I would name them Max and Missy. Such sweet babies. Beautiful markings on that Chunky kitty. Anakan is a handsome fella, and Bob is adorable and heart stealer. 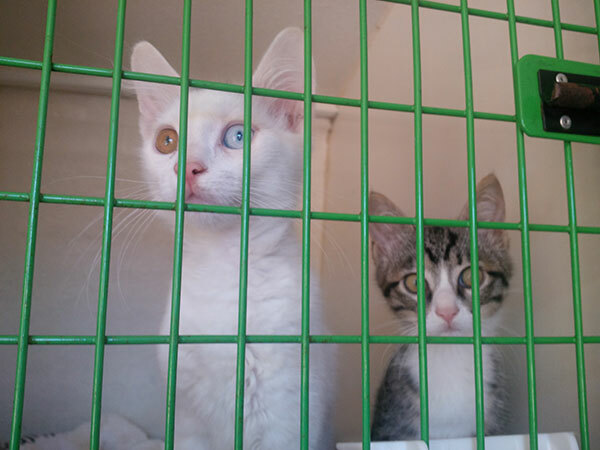 Flup and Sailer and such sweet kitties and the white one has two different colored eyes and is my fav. Good trip to you all. Thanks, the trip went very well. Gorgeous pups and older passengers too. We’re very taken with two coloured eyes and seem to have had many examples of the trait in recent passengers. Hurrah fer Flup n Sailor!!! Dey are purrsonal favez of mine! We fink Anakin iz gorgeeuss…tooked Mum’z breath away! We nose all da poocheiz n kittehz will get to where dey need to be safe n sound…. Oh my the puppies are so cute. 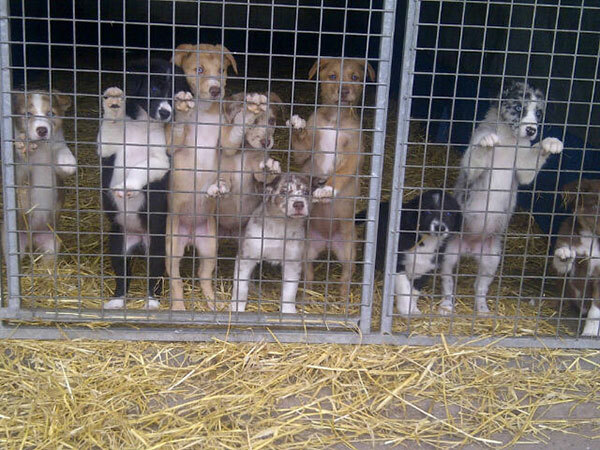 And they look to all be very well cared for and healthy. Yes, I be crying too if I had to put my dog on a plane to ride in the cargo hold. And what lucky cats to have been adopted by a lovely person. I’m so glad they are getting a wonderful home. The puppies are in bubblingly good health. 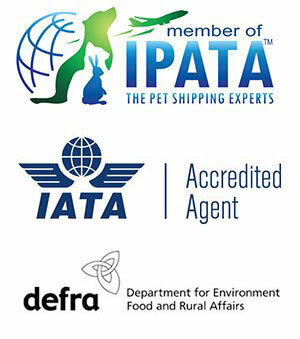 It’s a hard decision to fly a pet anywhere but leaving them behind isn’t an option. Those two kittens are much luckier than most and have gone to a very lovely household. That is so kind. When is your lovely girl travelling? Do look forward to meeting her! 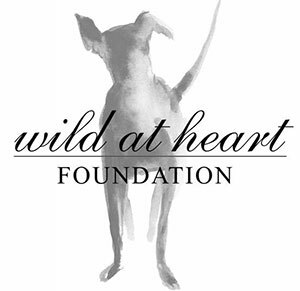 I like Lurchers, they have such an interesting history :o) I can’t wait to see Flup and Sailor in their new home, I bet their family will have tons of fun!